Stitching Place contemplates the memories of being within visited places. Each work alludes to a ‘fleeting moment’, of both being there and being remembered later, and conveys this lingering effect through fractured shape and colour. Each stitched image is an intimate memory and object, often hinting at aspects of human presence through road signs, tents or fences within the bush, coast or open pastures. Hand stitching is a focused way of making, creating private space around the concentrated attention of doing. 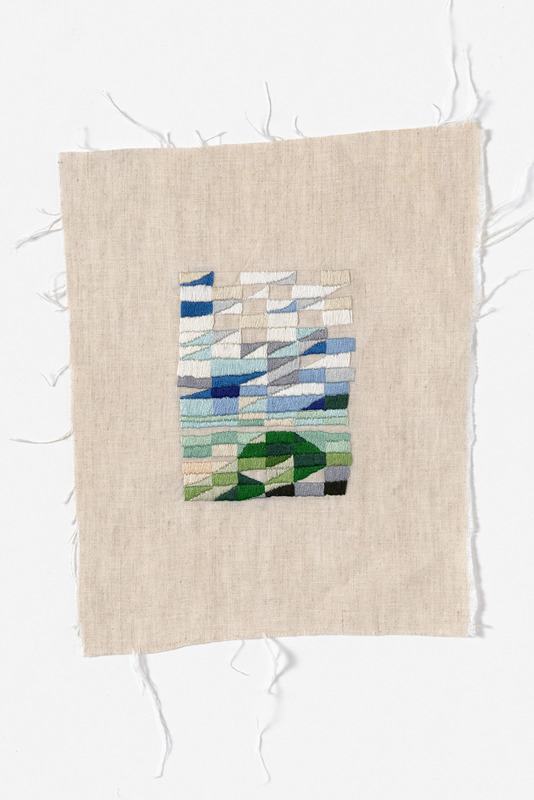 The works are deliberately small and fragile, made on and for the interstices of the everyday, and stitched while on the train, with a cup of tea at the end of the day, or during a craft evening with friends. In their use of recycled fabric offcuts they reflect what 70s feminist artist Miriam Shipiro might call ‘femmage’. The idea of ‘place’ grounds the location of the memories and identifies the landscapes that occupy the works.